I’m still attempting to clear my email mountain(s) and in doing so I’ve just been viewing some great images kindly sent to me by Ian Davies (Hoylake RNLI). There are some great old photos of Hoylake and Meols that I’ll share with you all in due course but I thought I’d start by sharing this one with you. It’s Trinity Road from years gone by – there isn’t a date so if you’d like to hazard a guess feel free. It could well date from around 1900. 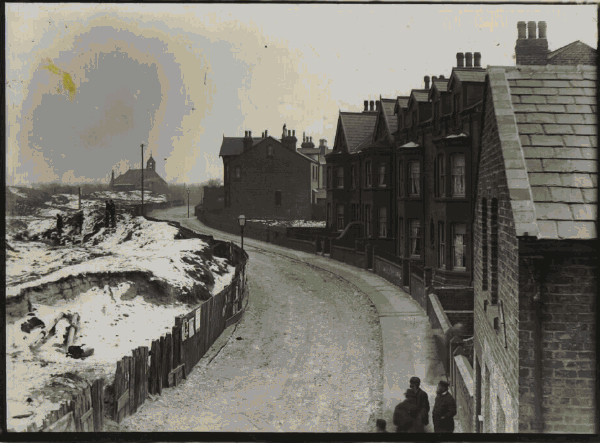 You can see the Parish Church in the background and of course houses hadn’t then been built on the lefthand side of the road (the view is looking up Trinity Road from near the promenade). What was that building in the foreground where the men are standing? It’s a garage nowadays but I’m sure one of you have previously mentioned what it was used for? Was it something to do with a rope business?? Anyway, as always feel free to share your thoughts. Oh, due to a little gremlin in the system yesterday, it wasn’t possible to leave a comment on the recent Lifeboat Day post …so if you been itching to share your comments you can now. Sorry about that. The building where the men are standing is now the Chequered Flag garage, but it was once known as The Bethel which was mainly for the benefit of local fisherman. They had been crowded out of the Trinty Road church which you can see in the picture. It is thought that as the transport links improved to the area the poor fishermen moved their place of worship to the building at the bottom of Church Road as it was known then and they would hold their services here on a Sunday night. It was also a better location for the men to congregate as from this location they could keep an eye on their fishing boats moored in the Hoyle Lake during bad weather. Learning from this correspondence that you are connected with the RNLI, I am wondering if you have access to the photographs which were on display 20-30 years ago in the previous lifeboat house ? There is a particular one of which I would very much like a copy. If you can describe the picture or name someone who appears in it I will do my best to find it for you, but was it 20 – 30 years ago when you last saw it or when it was last displayed! The undeveloped land across the road from the Bethel (where Avondale and other roads are now) was the gardens of a large house known as the Dale (hence Avondale). It was the home of Mr Swainson, a retired merchant who provided the money for the construction of Holy Trinity Church itself in the picture in the 1830s. There are not many pictures of the house itself around but it was quite substantial and surrounded by sandhills. It was pulled down right at the end of the nineteenth centiury when the houses were built. My Grandad, John Washington Parr, born 1892, was a member of the Bethel choir. We’ve just moved to 62 Trinity Road (on the corner of Back Sea View). We’ve fallen in love with Hoylake and its friendly, welcoming people. Some of my neighbours think our house may have been a post office once upon a time. Does anyone know anything. Or have any pictures of this side of Trinity Road?